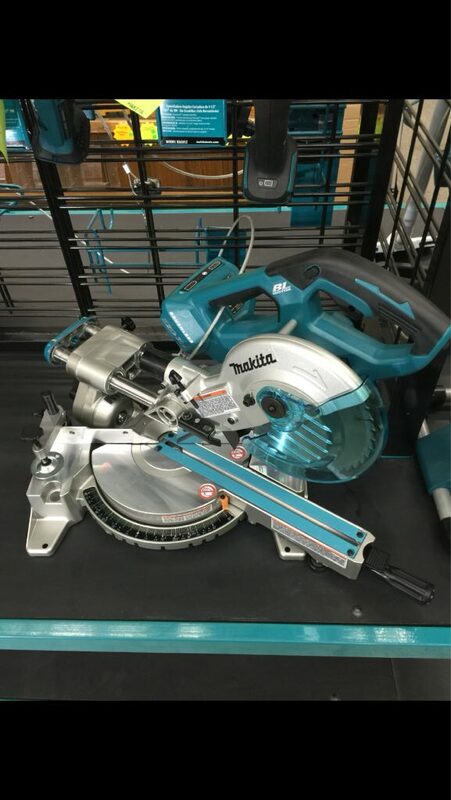 Looks like Makita released their new cordless miter saw. Brushless motor, 36v (2x18v), 5800 rpm. 599 seems a bit steep especially since the Dewalt is less than 400. If it's anything like their new brushless circ saw, performance should be good. I just read the specs and you can not compare the two saws. The Makita is far superior by the spec sheet. Twice the voltage/amperage which straight up means more power. Plus the Dewalt isn't brushless. The icing on the cake though is the cross cut capabilities. @90* the Dewalt will cut a 2x8", whereas the Makita will cut a 2x12". Even the NAINA Milwaukee only does a 2x10". Makita wins- unless you already have all yellow. It still will not cut 3 5/8 38* nested crown. I bought my Dewalt because the specs said it would.It does not.I did not buy a cordless to cut 2X12. If I spent 600.00 and found out it would not cut what I bought it for I would be twice as mad. Looks very nice. I assume that's a 10" blade? I've loving the competition among the different tool brands to come out with these innovative tools. Its changing the way we work for the better. I've played with one in person but wasn't able to cut wood with it. It's a 7.5" blade. It appears to be exactly the current 7.5" 18v LXT saw with a bigger motor and room for two batteries. That sounds like a winner to me. The Dewalt 20v is actually 18v, of course, so is close to the single 18v LXT saw in power. Does a cordless miter saw really make things go faster, smoother, etc? What are the benifits that you guys see in having one? When triming or framing, I usually have my saw and stand set up as a cut station. I don't really see where a saw that has less cut capacity would be justifiable. I can see if your job is more in and out and has a few cuts like replacement windows or if you want/ need to set the saw to cut on scafolding. Just interested in some of your thoughts. When doing a kitchen or bath remodel, setting a new doors, small things like that are nice to not have to drag out a cord just for a few cuts. For me, I'm mostly cordless and hate having to find an outlet just for a few items. It's nice just to set and go. For a whole house or larger job, set up the corded and go since I'm doing a lot of cutting and in one spot all day. It mostly comes down to what kind of work you do and your personal work flow. I just love the convenience and have grown to hate cords and hoses! When you do these small jobs do you cut inside or outside? If you cut inside the clients house, how do you control dust? Outside. I don't have good enough dust control to set up inside. Outside for new construction too. Would be nice to set up inside sometimes. I'm looking for a saw for doing blocking, something I can drag up on some scaffold while doing T&G, base recuts on the second floor, customer service, etc. I'm 98% new construction. The dewalt just dropped to $369 and comes with a 4.0ah battery. The makita is $600 and comes with no batteries, the reviews are based on using 2 5.0ah batteries. Makita smokes crack before pricing their cordless saws. This is not a corded replacement, it's a suplement. If it was a corded replacement it would need to be a 10" saw, then they might justify $600 for a bare tool, but even then... crazy. I love my DeWalt cordless miter saw. I really wish it had the ability to cut 3 1/2" base on both sides of the fence. Crosscutting, it can handle a 2x8 not problem. When crosscutting a 2x10, I just need to roll up the outside edge a bit to cut through the whole board. Not a big deal. I pull out the 12" saw for all my big trim jobs. I would still love to get my hands on and use this saw. I think it would be fantastic. I just wish either came with a big larger blade. I got an email from Factoryauthorized or CPO with an offer of buy one of Makita's 18v hammer drill kits and they give you a free choice of 36v tool. If the saw had been a lefty I would have grabbed it. I saw the small Dewalt slider at homedepot, it only cross cuts 8", sort of defeats the purpose of a slider. I'll stick to my 12" non slider, at least I can cut tall base standing up. Really hoping and waiting for Milwaukee to drop their 10" slider here in the states. Put a 9.0AH pack in that and now I think you have a real saw. Hopefully it happens sooner than later. I was hoping they were going to respond to Dewalt when they released theirs. Guess we will see. Not really, the cut of a 7.25" blade without the slide is really small. Having the slider lets them use a smaller blade. They couldn't make it slide out another 4 inches? Really? You can buy a cheap Kobalt 7-1/4" slider if that's all you want, and for $300 less.